What Makes the Best VPN Service? The best VPN service should meet a few essential criteria beyond simply masking your IP address. A VPN should secure your connection, as is expected, but the best VPN provider should also perform well while it allows you to seamlessly explore the open Internet on servers owned – and with infrastructure managed – by the VPN company. In addition, the best service should offer a VPN free trial account to help you determine how the service best suits your needs. Every device uses an IP address to communicate with the Internet, but your native IP address displays your true location, which you don't need to divulge to anyone. Changing your IP Address with VyprVPN is your first step toward privacy. Because ISPs own the IP addresses they provide, they can monitor your connection and view your activity as well as throttle your speeds based on specific usage. Internet providers don't need user consent for invasive practices, including selling an Internet user's personal data. Using a VyprVPN IP address makes it difficult for an ISP to slow your Internet connection, and they can no longer collect data about the content you access. Netizens worldwide are in a constant battle against governments invading their private lives, including snooping on private Internet connections. Governments cannot spy on a secure connection like VyprVPN, and therefore your activity online remains obfuscated to their prying eyes. Network restrictions are a dime a dozen on public, school, business and government-controlled networks. Connecting to a secure VyprVPN server anywhere in the world gives you full access to a free and open Internet, the way the Internet was meant to be enjoyed. Opportunistic hackers and bots scan the Internet for devices they can exploit for identity theft and spamming. VyprVPN naturally blocks unrequested inbound traffic like this without additional configuration. DDoS attacks shutting you down? 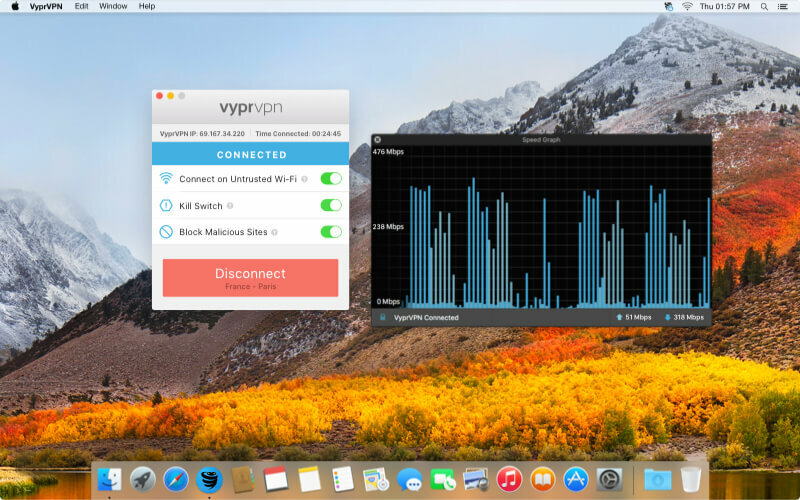 VyprVPN mitigates unsolicited traffic and offers connections to over 200,000 IP addresses so you can play games and enjoy your online experience without obnoxious disconnects. Get the Best VPN. Sign up for a VyprVPN Free Trial Today. VPN companies cannot engineer privacy into their service if they don't own and operate their infrastructure. Some VPN providers make you scroll through an endless list of servers hosted by 3rd parties, and we don't think that's acceptable. Because we own our VPN network of 700+ servers in 70+ countries, VyprVPN's clustered server solution makes sure the location you want to connect to is always available. If a server has an outage, each cluster dynamically switches your connection to another server. In-house network engineers with decades of experience constantly optimize our global VPN network for speed, and you can reliably connect to any VyprVPN server at any time without restrictions, throttling or download limits. Easily switch between server locations at no additional charge. The best VPN services should provide multiple protocol options and convenient features to help you tailor your VPN to your preferences. In addition to popular protocols like OpenVPN™, L2TP/IPsec and PPTP, VyprVPN offers our proprietary Chameleon™ technology, a protocol which utilizes the unmodified OpenVPN 256-bit protocol, then scrambles the metadata to prevent DPI, VPN blocking and throttling. Available exclusively to VyprVPN users, our Zero-Knowledge DNS is completely owned and operated by us and will never log your Internet activity or censor websites. You are automatically connected to VyprDNS when you connect to any of our worldwide servers. Our engineers developed a comprehensive, customizable Kill Switch which makes it simple to adjust your personal security settings based on how you want them to function. 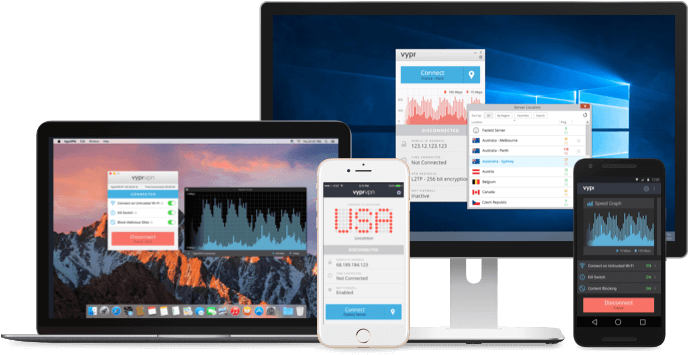 VyprVPN offers VPN apps for every device, including Windows, Mac, Android, iOS, Routers and more. 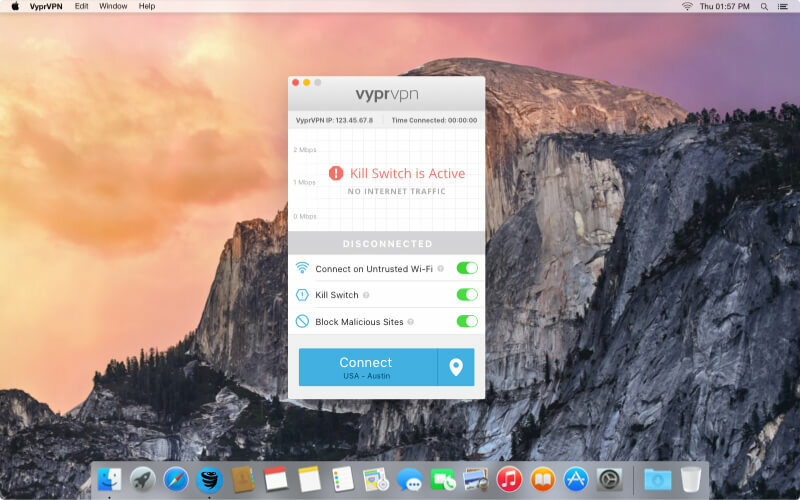 Customize your VyprVPN app by selecting connection behavior on a per-app basis, take advantage of the Fastest Server option, adjust Kill Switch settings, establish a trusted Wi-Fi network list and choose your favorite connection locations for greater control. Our 24x7x365 Email & Chat Support is always available, or search for answers to common questions using our Support Center. That's also why we don't employ 3rd parties the way many other VPN providers do. We own and operate 100% of our servers because to do otherwise would introduce additional vulnerabilities to our users. Companies which use 3rd-party cloud servers or rent server space from a hosting provider don't have as much control over their users' information and data. What the 3rd party does – or does not do – is not within the VPN company's control; meaning your privacy may be at risk. VPNs are inherently less safe and secure when they use 3rd parties – and, unfortunately, VPN companies often do not disclose when they do. Discover what a difference the best VPN service can make for your connection. Sign up for a VyprVPN free trial today.